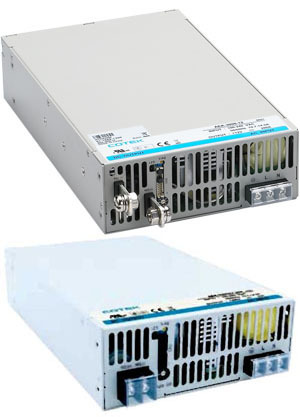 Cotek Series AEK are 3000W programmable single-output, power factor corrected, OEM switch mode dc power supplies featuring high power density and low profile (1.5U). Output voltage and current are both programmable from 0 to 105%. They feature wide range input, constant current limit for battery charging operations, forced current sharing when operating in parallel, remote access via RS232, RS485 and I-squared C, selectable auxiliary output: 5V/0.5A, or 9V/0.3A , high-performance and low cost. Available in models from 12V to 60V and from 150V to 400V.